Trump’s recent visit to Puerto Rico illustrated an arrogant attitude toward a dire situation. At least 30 percent of Puerto Rican’s have no electricity, and electric power is not likely to return until the end of October. The president’s threats to cut off aid expose the real intentions of the U.S. ruling class. Socialist Action reporter Ernie Gotta connected with Mikael Rosa of the Movimiento Independentista Nacional Hostosiano to see what the political situation is like following the devastating hurricanes. Mikael will speak in New Britain, Conn., on Nov. 4 during the 2nd annual “The Solution is Socialism” conference. Go to Facebook.com/SocialistActionCT for more details. 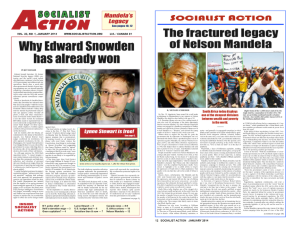 Socialist Action: What is the situation on the ground? Can you explain how relief efforts are progressing? Mikael Rosa: Is very important to make a distinction between what is happening in the metropolitan area of San Juan, and the rest of the island. The reality is that there are areas that the local and imperial authorities have not even looked at. We still have people without basic supplies like water and food. People have lost their entire houses, and others are facing the challenge of acquiring medicines and treatment for serious diseases like diabetes and cancer. While this happens, our hospitals are having energy problems, and their generators are not working. SA: FEMA had this to say about the crisis in Puerto Rico: “Not our job to deliver water and food.” President Trump echoed that sentiment when he made a statement about pulling back federal relief. What is your response to the U.S. government? MR: Those statements are just part of their public policy as colonizers. Colonies are a business, and all they care about is profit. If this situation related to Hurricane Maria endangers their interests, they prefer to let the Puerto Rican population suffer, instead of providing the humanitarian aid required. SA: Trump took to Twitter and made the following remarks: “‘Puerto Rico survived the hurricanes, now a financial crisis looms largely of their own making,” says Sharyl Attkisson. A total lack of accountability, says the Governor. Electric and all infrastructure was disaster before hurricanes.” In reality, it is not hard for one to imagine that the legacy of colonialism alongside the forced placement of the fiscal control board has had a major impact. Can you explain the real root causes of the disastrous infrastructure and financial crisis? MR: The economy of a colony functions for the colonizers’ interests. For decades, U.S. corporations have taken large amounts of profit from us, thanks to tax exemptions. We don’t have the tools to create our own economic project, nor to protect our national production. Federal-imposed laws do not let us develop local industries. So, as time passed, the Puerto Rican economy was based on speculation—and now we all know the consequences of that. Actually, I think President Trump knows very well the roots from our crisis, since he was one of those who took advantage from the economic speculation here in Puerto Rico. SA: How does Wall Street view the situation? Do they stand to benefit? Is there a real possibility of developers and banks taking over large sections of land? MR: All Wall Street cares about is profit. I don’t want it to sound like a dogma or a mantra, but it is proven that all they care about is their money. Before hurricane Maria it was extremely difficult to pay our debt, but now it is impossible to pay it. If they insist in making us pay an illegal debt, they will make even worse the humanitarian crisis in Puerto Rico. SA: Can you explain role of the governor and local politicians in Puerto Rico in relation to the exploitation by the U.S.? MR: The best answer to this question is to take a quick look at the visit by President Trump to Puerto Rico. Our local politicians are allies of U.S. interests. They were smiling while Mr. Trump was making fun of our situation. They thought that the federal government would quickly solve our situation. Instead, what we are facing is humiliation, with the consent of our local politicians. SA: Please explain for our readers the meaning of the struggle for independence in the wake of the current crisis. MR: A basic requirement for the development of a country is the capacity to have open and free negotiations with the whole world. In this context, it is essential to receive aid and relief from every part of the world. Our political situation does not even let us have direct contact with other countries in order to move forward in our recuperations. The fact that we are not an independent country means that we won’t be able to build a new country under our terms. Instead, the recuperations will be in function of U.S. interests. As a consequence, we will go back to the same problems and crisis.